Japanese dramas have certainly come a long way in the last decade. While Korean dramas or western series have already made a niche, Japanese dramas have an emerging audience. There are millions of people worldwide who would like to binge on Japanese dramas as well, making it a progressive industry. If you are also among those fans or a newbie who would like to start watching Jdrama, then read on. In this post, we will let you know about some of the latest dramas in Japanese that you should consider watching in 2018. 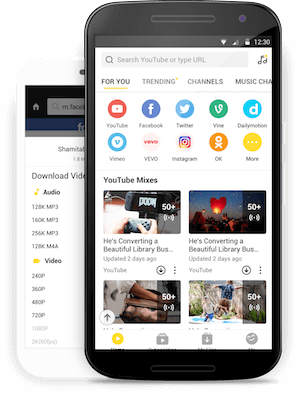 Snaptube is a freely available Android app that is packed with tons of features. You can simply download the app on your device by visiting its website. It has a sleek and easy to use interface that will let you look for the video of your choice in seconds. The results will be extracted from several streaming websites in one place. Therefore, you don’t need to go through the hassle of switching between various apps. You would be able to find all kinds of new and old Japanese as well as other kinds of Asian dramas on the app. It has a fast loading player that supports HD quality streaming of content. Simply download the Snaptube app on your device and watch various Japanese drama series as per your convenience. Here is our handpicked list of some of the most promising new Japanese series that you should consider watching this year. Also known as Resident Complex, this Japanese TV Series is the latest offering of Fuji TV. Its first episode was aired on January 18, 2018 and is scheduled for every Thursday night telecast. It is the story of a scuba driver instructor and a salesman, living in the same apartment. What revolves around this corporate housing is a fun and romantic story that looks quite promising. This Netflix original series is known for its gripping story and compelling casting. It is the story of a 29 year old artist who travels back in time to save the day. This leads to several complications as he gets framed for the murder of his own mother. What leads ahead is an unforgettable story. This is one of the most anticipated Japanese dramas of 2018. Based on the novel of the same name, it stars Kai and Kana Kurashina. It is the story of a woman, who is running in her early 30s. Working in a garment factory, she meets a photographer who changes her life forever. This mini-series is distributed by WOWOW network. Yes, you have guessed it right. This Japanese TV drama is based on the famous manga series of the same name. It is certainly a unique and interesting story of a young girl who moves to a new city. Her fascination towards jellyfish influences her life choices as she gradually meets new people and gives a second chance to love. The series is telecasted on Fuji TV, every Monday night. This Japanese drama started in January 2018 and stars Kento Yamazaki, Mugi Kadowaki, and Mackenyu. The series certainly has a mesmerizing plot. It is the story of Otaro Dojima, a man who is devoid of love and only considers money as his priority in life. Everything changes when a mysterious woman kisses him. After that kiss, he keeps waking up back in the past with lots of unanswered questions and a mystery to unravel. Netflix is certainly pushing the envelope by developing tons of original content for its Japanese audience. Hibana: Spark is a gem of a Japanese drama that is based on a critically acclaimed novel. It is the story of a Manzai comedian, who is struggling in his career. Later, he meets another older comedian, who changes his perspective towards life. It is a gripping story which has been directed with utmost perfection. If you like mysterious sci-fi series, then you should certainly give this drama a try. It is the story of various individuals and how their life interconnects. One day, a woman receives a call about an upcoming earthquake. She was given a chance to travel back in time and change the course of her life. Although she agrees, she realizes that she is not the only one taking this journey. This futuristic Japanese drama was first aired on January 11, 2018 on NTV. This Japanese 2018 drama will introduce you to a unique family. It is the story of three siblings – a doctor, a lawyer, and a cop. Together, they try to solve a family problem which lands them into a rabbit hole. It started telecasting on NTV from January 13, 2018. Though, you can stream it on various other online platforms as well. The next stop on our list is another Netflix original series that you got to watch this season. It is the story of Shin Machima, a struggling novelist. One day, five unknown women come to his house and offer him a million yen to rent his place. He accepts the surprising offer, without knowing that each woman comes with a past. Watch this gripping story, as the protagonist uncovers the true identity of his new flatmates. While Anone might be the last entry in our list, it is undoubtedly one of the most interesting Japanese new dramas you can watch. This heart-wrenching drama revolves around the everyday life struggles of a young girl, Tsujisawa Harika. She lost her family at a young age and goes through a tough time. All of this changes when she meets Hayashida Anone – an elderly woman who takes her in. Together, as they try to start their story from the scratch, they end up touching each other’s lives in an unexpected manner.